The first of three-Day Ones is in the books in Los Angeles as action opened for the World Poker Tour’s Legends of Poker Main Event began. One of the stalwarts of the WPT schedule – it is one of three tournaments that have been a part of the stable of events since the inception of the WPT (the other two are the Five Diamond World Poker Classic at the Bellagio and the L. A. Poker Classic at the Commerce Casino) – the Legends of Poker has traditionally been the tournament that the players came back to in starting the WPT season. With expansion, however, the Legends now is around the start of the season (the recent WPT Choctaw now opens the post-World Series of Poker schedule for the WPT), but the players still come out as if it is the first event. With its single re-entry per day and opportunity to enter each of the three-Day Ones (if necessary), the Legends give the players plenty of chances to get in on a big payday for the eventual champion. Coming out of the gate on Friday morning, the tables around the Bike were replete with many WPT champions. Former WPT announcer and Poker Hall of Famer Mike Sexton was joined by Scott Clements and Daniel Strelitz in upholding the “champion’s honor,” while players like Matt Stout, Jeremy Ausmus and Eric Baldwin filled in other seats. As late registration played out, pros such as Curt Kohlberg, Barry Hutter, Jake Schwartz, Valentin Vornicu, and WPT Champions’ Club members Mohsin Charania and Sam Panzica made their appearances on the Bike tournament floor. This event on the WPT schedule marks the beginning of the usage of the “Action Clock” at WPT events. The “Action Clock” will be activated when play reaches one table before the popping of the “money bubble.” When the “Clock” is activated, players will have 30 seconds to make their decisions unless they use one of their allotted Time Chips for a 60 second extension. 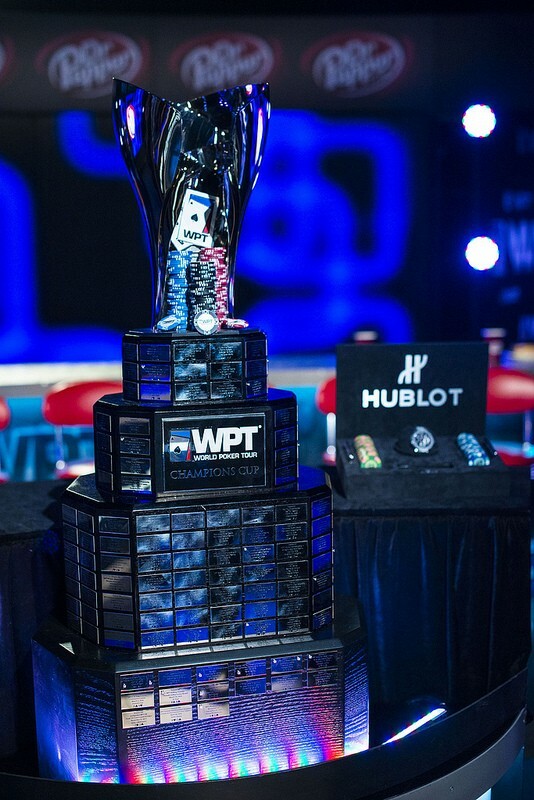 It is one of the innovations that the WPT has been trying out in other events, most notably in the WPT Tournament of Champions, and will be a permanent part of the Season XVI schedule and for the near future. The 2017 WPT Legends of Poker is also making history on another level. The one billionth dollar in prize money will be awarded by the WPT in this event and there are plans for a bonus prize for the player who earns the billionth dollar in WPT history. Depending on the number of entries, one position will be worth a bit more to a player (save for the champion and anyone who runs extremely deep in the Legends) than just getting another flag on their Hendon Mob resume. Strelitz was one of the players who had a difficult time with the first Day One. On a board of A-7-4-5-5, Ankush Mandavia pushed all in off the button. Strelitz didn’t believe him, making the call, and was dismayed to see Mandavia table an 8-6 for the turned straight against his A-J (two pair) to double up Mandavia. Strelitz then went up against Gaurav Raina after a Q-8-3-7 flop and turn, getting all of Strelitz’s chips to the center. It was another unfortunate break as Strelitz saw his A-Q crushed by Raina’s pocket eights, sending Strelitz to the cage to use his re-entry option for another $4000. Strelitz wasn’t the only player who had to exercise the re-entry option. Ray Quartomy utilized the re-entry to no avail, as did Strelitz, but Marvin Rettenmaier and Hutter made the most of their second bullet and survived to the end of the day. Most impressive of all, however, was the man who would end the day as the chip leader, Thomas Zanot, who will have a story for the remainder of his life in a hand that earned him the chip lead. Late in the evening, Zanot made a raise out of the hijack only to see none other than Phil Hellmuth, who will be a part of the WPT festivities this fall as host of “The Raw Deal” after Tony Dunst’s ascension to the analyst seat for the WPT broadcasts, make the call off the cutoff. Phong Nguyen also called off the button, but it was Eddy Sabat’s all in off the small blind for 6800 chips that perked everyone’s attention. Action moved to Zanot, who moved all in “over the top” of everyone involved in the hand with his 155K in chips. This didn’t slow down Hellmuth, who plopped his 35K in the center, but Nguyen left the act. The weekend should see a throng of players turn out. If 155 entries were big for an open, then the possibility of doubling that for each of the next two-Day Ones will be realistic. Saving that, players will also have one “last chance” option for getting in prior to the start of Day Two. It should make the 2017 WPT Legends of Poker one of the bigger events of the Season XVI schedule.